By Joseph R. Svinth, e-mail: jrsvinth@juno.com. Copyright © 1999 All rights reserved. A Hokubei Butokukai kendo tournament, Gresham, Oregon, February 1940. The Japanese script at the bottom of the photo reads "ji-chi seinen-dan kendo-bu soritsu man go shunen kinen o-shu rengo taikai, showa jugo-nen nigatsu juichi-nichi," or "Oregon Combined Kendo Tournament, in commemoration of the completion of five full years from the foundation of the G-T [Gresham-Troutdale] Youth Club Kendo Division: February 11, 1940." The characters at the top read "hoshuku kigen nisen roppyaku-nen," or "Celebration of the Year 2600 of the Japanese Era". In March 1905 there was a kendo demonstration at the University of Washington in Seattle. In June 1910 there was a similar exhibition during the dedication of Tacoma’s Stadium High School Coliseum. As far as is currently known, these were the earliest public kendo exhibitions in the Pacific Northwest. The region’s earliest known kendo tournament took place in Seattle on August 6, 1910. The location was the Great Northern docks near modern Pier 91, and the occasion was the Nippon Yusen Kaisha (Japan Mail Lines, or NYK) fleet championships. Yet despite several well-publicized public demonstrations, for the next twenty years kendo remained relatively obscure. The reason was a combination of the expense of equipment and the scarcity of teachers. Around 1924, however, the Seattle Kendo Kai obtained a permanent home, and by 1929 its junior members were associated with Boy Scout Troops 55 and 56. The Seattle Kendo Kai was directly affiliated with the Dai Nippon Butokukai in Japan. Its instructors during the late 1920s included Morita and Morishima. During the 1930s Umajiro Imanishi supplanted these men. Other Issei instructors associated with this club included Nakagawa, Ogami, Ohya, Sawada, Tsuneishi, and Yoshitomi. "Few were highly graded," Jim Akutsu later recalled, "and by the time I got dan [senior] rank, I could beat most of them. But beating them was no big deal since they taught kendo as mental discipline rather than military training or sport." The Seattle Kendo Kai had one affiliate, a junior club associated with Seattle’s Maryknoll Catholic School. Tamotsu Takizaki, 5-dan, taught there. "I learned much from Takizaki Sensei," former student and present-day Chicago Kendo Dojo leader George Izui recalled decades later. "Not only kendo techniques but also his gentle but strong ways." Added another former student, Henry Itoi, "Mr. Takizaki at the Maryknoll gym was quiet in posture but swift -- like movie samurai, Toshiro Mifune." 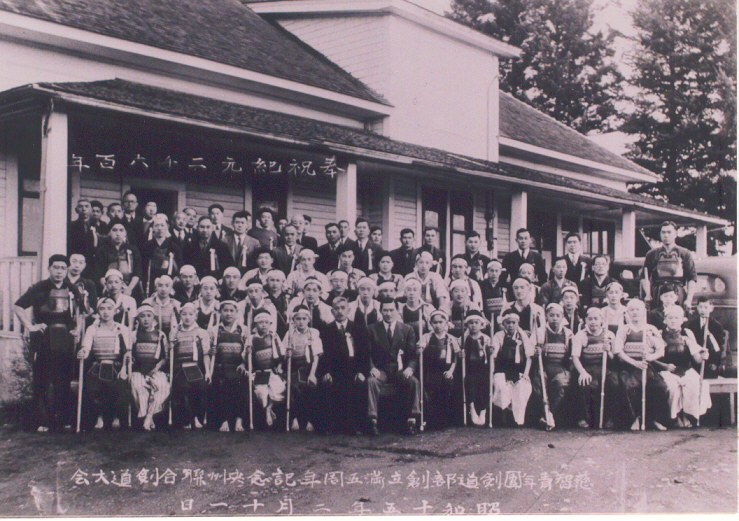 During the fall of 1936 the Hokubei Butokukai, a California kendo association with its international headquarters in Japan, also came to Seattle. Its Seattle leader was the local businessman Heiji ("Henry") Okuda. Okuda did not practice kendo himself. ("I can’t say I have any real hobbies," he once told a reporter from the Japanese-American Courier. "But I do like to sit down and read.") On the other hand, men Okuda knew in California told him what a fine job the Hokubei Butokukai leader Tokichi Nakamura was doing with California Nisei. So, when Nakamura visited the Pacific Northwest in September 1936, Okuda agreed to lend his considerable prestige to the establishment of a Seattle chapter of the Hokubei Butokukai. This club met at the Seattle Buddhist Church until its own dedicated dojo opened at 1212 King Street in 1940. The following were some leaders of Northwest kendo during the mid and late 1930s. Umajiro Imanishi, who was the Seattle Kendo Kai kantoku, or superintendent. Recalled George Izui, "He controlled us young ’bucks’ as would a ramrod sergeant running his platoon. Unfairly at first, we young upstarts showed no love for him. Later we realized and began to appreciate the unselfish sacrifice he made in playing the ’heavy’ role for our sake." Added Henry Itoi, "I never asked, but I thought Mr. Imanishi might have been a drill sergeant. I respected him highly as an instructor and liked him. From him we learned to abolish any kind of sloppiness in ourselves." Goro Mochizuki, a Seattle judoka who upon moving to Oregon in August 1933 also started a kendo class at Portland’s Obukan judo dojo. Yoriaki Nakagawa, who besides being a kendoka was also the principal of the Japanese Language School to which many Seattle Nisei were "encouraged" to attend daily after the public school let out. George Izui has described him as "a tough disciplinarian who ran a no-nonsense school, and his kendo kamae was of the same nature. His refereeing (only one person officiating in those days) was something to behold: firm, crisp, decisive, and fair." Jiro Sakano, who taught kendo at Portland's Columbia Boulevard Seinen Kai before World War II, and was a leader of Northern California kendo afterwards. Kazuo Shoji, whom George Izui remembered as "a sensei of the present Seattle Kendo Kai until his retirement. He was a very strong person with arms as large as my legs. Noticeable with his aka doh (red breastplate), I admired his bold, strong, fearless kendo style." Tamotsu Takizaki, chief instructor, said George Izui, "was a gentleman and a great teacher. A product of the old bujutsu, having been awarded a certificate of proficiency [menkyo] in martial arts, his kendo was kiru kendo (’to cut’). His kendo was not of the light ‘razzle-dazzle’ flashy type, but grand, stately, immovable, ’no-wasted-motion’ style. Although not a large man by today’s standards, to go against him was as though bumping against a brick wall in one moment, then his light body shifting left the attacker helplessly shooting off into space at the next moment." Richard Yamamoto, who said: "I received my 5-dan and took my renshi [instructor’s] exam at the Dai Nippon Butokukai in Japan in 1939. I came back to the States soon after. I instructed kendo at Seattle, South Park, Tacoma, Sumner, Puyallup, and Portland. I was what you call a junkai kyoshi, or roving teacher." Kiyoshi Yasui, whom George Izui has described as "a very good kendo person who had come home [to Seattle] after completing his academic education in Japan. Although he was a consistent winner, he was very low-keyed and modest, and we all admired him. " Jokatsu Yukawa, kendo and judo teacher (and minister) at the Tacoma Buddhist Church from 1931 to 1933. "Reverend Yukawa furnished a model champion with his dynamic personality," Aki Hayashi later recalled. He was "a no-nonsense person who disciplined with a ‘twinkle’ in his eye." During the 1930s, about 10 percent of the students at the Tacoma Buddhist Church and the Seattle Kendo Kai were female. "I was most nervous about practice fencing with Mr. Takizaki’s daughter, Teresa, when she showed up," Henry Itoi recalled in 1999. "The fellows were reluctant at first to hit her. But we found out in a hurry that she could dish it out vigorously, and take it too." Explained Sachiko Yamamoto Oyanagi in 1998, "Although us girls were few in number, we strived to do our utmost." As for kendo's long-term value, Mrs. Oyanagi added that the "most lasting experience was not the sport but what it taught. Kendo taught me to discipline myself. So many sports are for skill and ability. But in kendo you are taught respect, endurance, and love of mankind." Up to about nikyu [2-kyu; an advanced beginner’s grade], we did slam-bang kendo. That is, we’d put on armor and pick up swords and bang away at each other. But once we made nikyu, Takizaki Sensei took us aside and said that each stroke was supposed to be clean, that one stroke should do the work. We had to know the opponent’s intention, and to feel his vibrations. For that, he had us meditate. I remember going to kangeiko (mid-winter training), in winter at five o’clock in the morning. We used to go to kangeiko – for two weeks – every morning. It was cold! The instructors were all ex-soldiers of Japan. In a way they treated us like they were in a military camp… They taught us a lot of manners, Reigi-tadashii (be polite). Certainly they taught you that there was a pecking order – you know exactly where you are in the pecking order. Each large prewar kendo club organized an annual shiai, or contest. Although of course everyone preferred winning to losing, the goal was more to foster cooperation than to acquire trophies , and one of the measures of success was the quality of the food served during and after the matches. A contest was refereed by one person. His calls were never questioned. If a contestant had a doubt about the official’s call, he tried to do better next time, so there would be no doubt. There may have been penalty rulings, but I cannot recall anyone having been charged with one. Teammates did not applaud or shout any encouragement, advice, or joyous approval. The spectators may have applauded a good contest, but I do not remember. The Northwest’s final prewar kendo tournament took place at the Hokubei Butokukai kendo hall at 1212 King Street on Sunday, May 4, 1941. Besides competition in kendo, said the Japanese-American Courier, there was also a display of "‘Kendo-no-kata,’ a form of fencing which is done by two kendo instructors with real glittering Japanese swords." All US kendo clubs closed following the Japanese attack on Pearl Harbor in December 1941. Unlike Canada, there was no kendo in US "relocation centers" during World War II. So while World War II helped spread kendo into Ontario and Alberta, in the US kendo did not resume until the mid-1950s. In Spokane, pioneers of the postwar revival included Sgt. Martin Di Francisco, who taught kendo at Fairchild Air Force Base from 1956 to 1960; he had learned his kendo in Japan and was an Air Force close combat instructor. In Seattle, postwar pioneers included Umajiro Imanishi, Kazuo Shoji, and Kiyoshi Yasui. Their reformed Seattle Kendo Kai couldn’t train at the prewar Hokubei Butokukai kendo hall, however, as in December 1951 that building had been sold to the Nisei Veterans Committee for use as a meeting hall. So the club’s first dojo was in the gym at Seattle’s Morrison Hotel, and later it moved to the gym at St. Peter’s Episcopal Church, where it still holds classes today. During the early 1960s a kendo club opened at the Tacoma Buddhist Temple. Its head instructor, Rod Nobuto Omoto, was from Oregon but had received his kendo training at the Budo Semmon Gakko, or Busen, in Japan before World War II. Mas Tanabe and Yosh Tanabe (no relation) assisted in Tacoma kendo instruction. A kendo club formed at the University of Washington during the early 1970s and to facilitate tournaments and regulate promotions the Washington State Kendo Federation was established in 1974. This organization’s by-laws and constitution were approved on March 9, 1975. The President was Rod N. Omoto. Vice President was Kiyoshi Yasui. Paul H. Kurose was Executive Secretary, Treasurer. Hitoshi Mohri was Secretary of Internal Affairs, and Recording Secretary was John Sullivan. In 1975 Steven Strauch and Tomotsu Osada organized what became the Obukan Kendo Club in Portland, and then affiliated with the Washington State Kendo Federation. Over the next fifteen years clubs in Alaska, Idaho, and Montana also affiliated, and as a result on March 3, 1991 Washington State Kendo Federation voted to change its name to the more appropriate Pacific Northwest Kendo Federation (PNKF). By November 1999 PNKF had sixteen member clubs, plus several more budding. For example, there is currently an active program at Tacoma Community College, there’s a revival of the Washington State University Kendo Club, the Bellevue Kendo Club is helping establish a dojo at Everett Community College, Idaho Kendo Kai is helping people practicing in Pocatello, and Obukan Kendo Club is encouraging incipient clubs in Corvallis and Eugene. Welcome to new members as well as to old friends from Canada and elsewhere.